What do you do with an object, purchased as a central part of an exhibition, which is corroding on display? This was the question conservators were faced with at the Pitt Rivers Museum at the University of Oxford (where I have been completing part of my third year internship) when deciding what to do with a tattooing instrument which was exhibiting signs of deterioration while on display. 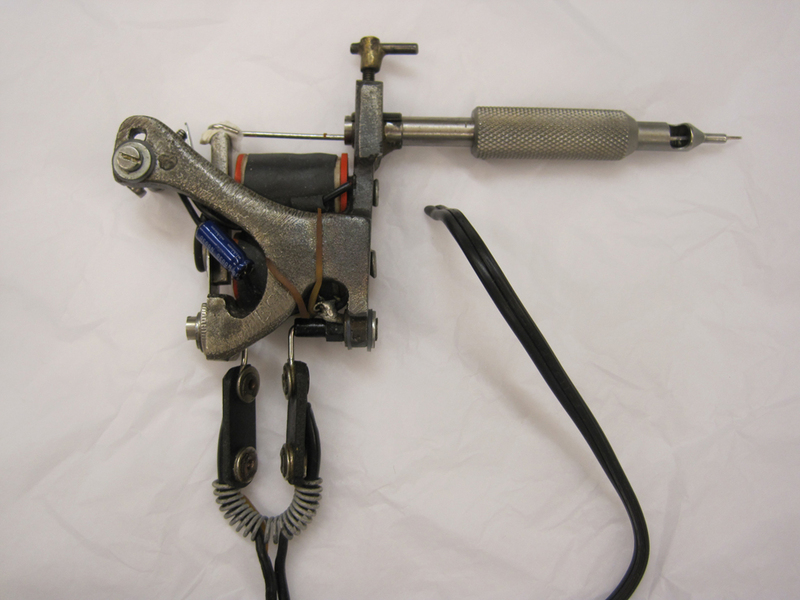 The tattooing instrument (2001.41.1) was made by a tattoo artist and donated to the Pitt Rivers Museum for its Body Arts display in 2001. 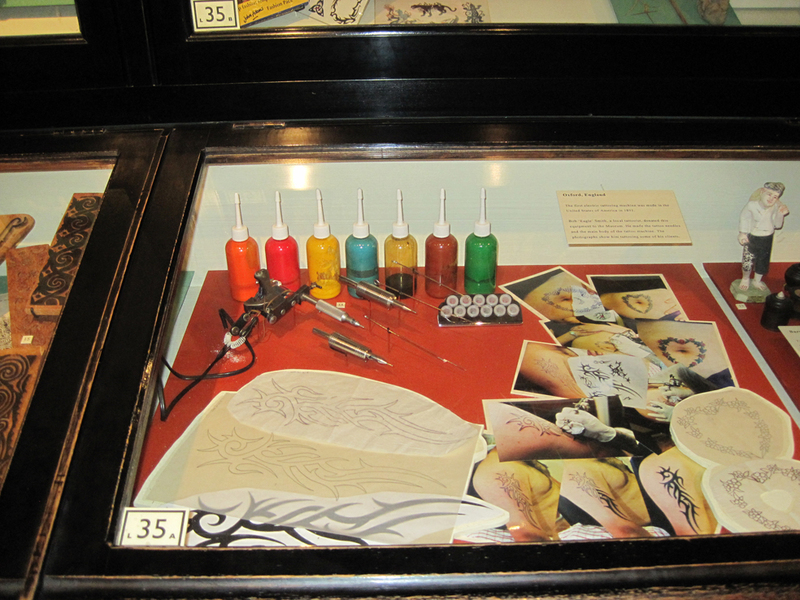 Since the object’s installation, it has been displayed along with other components of modern western tattoo application such as different colors of ink in plastic bottles, tracing paper, and needles. A museum guard noticed its corrosion in the winter of 2011 and drew the attention of conservation to it. 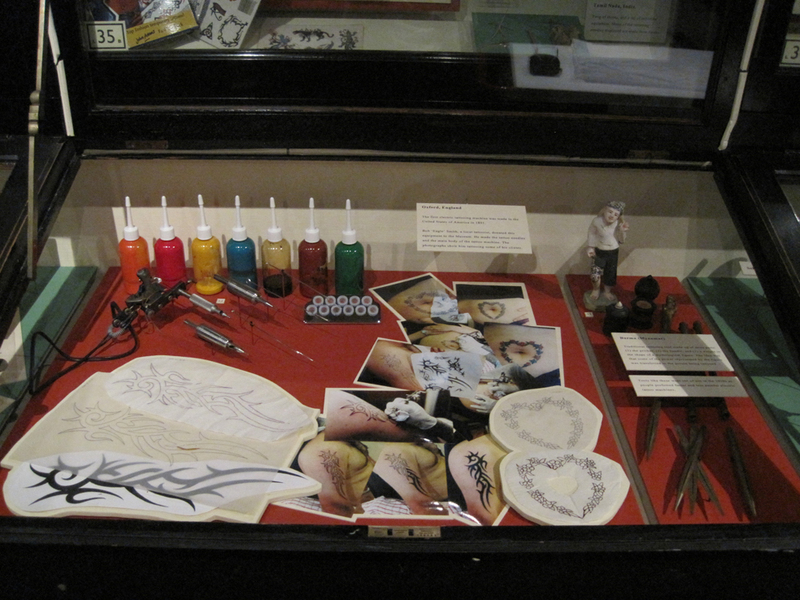 The Body Arts display with the tattooing instrument in the upper left corner. The tattooing instrument consists of the body of the instrument, a needle, and the power cord. There is a coiled wire around the power cord where it attaches to the instrument’s body. 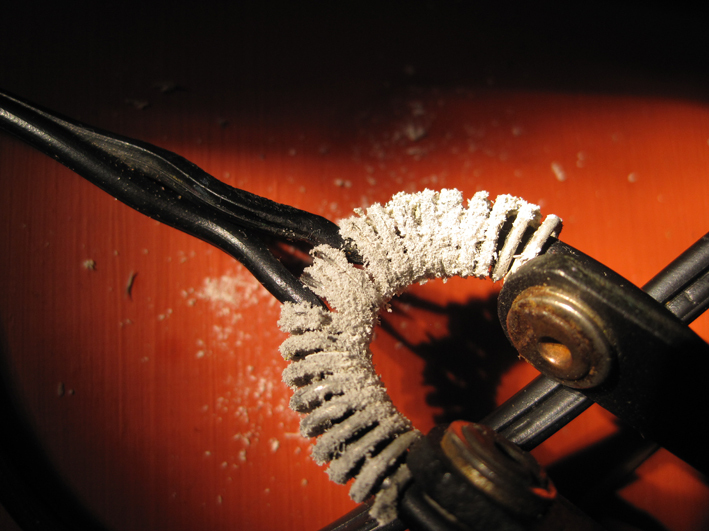 This coil had developed loose white needle-like corrosion crystals covering most of its surface. Detail of corrosion on tattooing instrument. The conservators reviewed the object’s condition and decided that it would be best to try and analyze the corrosion that had separated from the tattooing instrument before deciding to remove it because of the central role it played in the display. 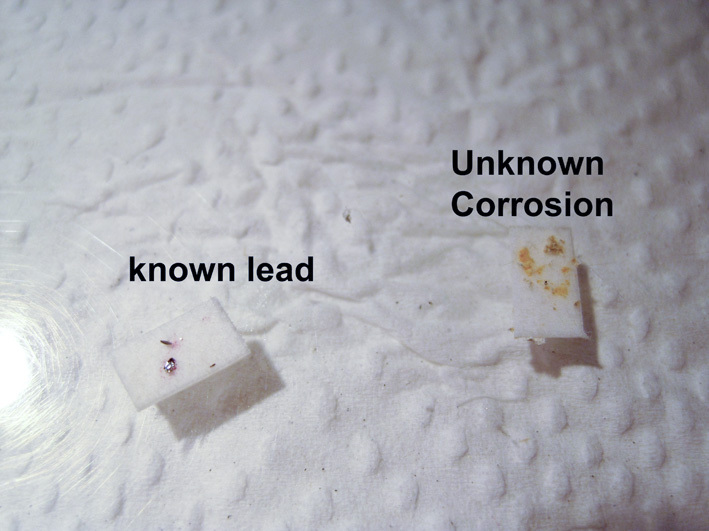 The loose white powdery corrosion below the object was collected and brought back to the lab. Spot tests for chlorides and carbonates were conducted using the protocols in Odegaard et al. (2005). The corrosion products tested negative for carbonates and positive for chlorides. A lead spot test was conducted using the Plumbtesmo papers, which produce a pink color in the presence of lead. However, the area around the sample turned orange. A known sample of lead turned the paper a pink color, indicating that the orange result was not due to issues with the test paper but to the sample. Due to the inconclusive spot tests, the tattooing instrument was removed from display for analysis with XRF. The coil and corrosion products were examined with X-Ray Fluorescence spectroscopy (XRF) (Bruker Tracer III-V). Based on the XRF results, the coil is composed of iron coated with cadmium. The corrosion product, when analyzed on its own, had a strong cadmium peak indicating that it was the cadmium that was corroding. When the exhibition case was opened to remove the object, it smelled strongly of pesticides like dichlorobenzene or naphthalene. There is a possibility that the organic acids from the pesticides or other materials in the case reacted with the cadmium, as discussed by Scott and Derrick (2007). 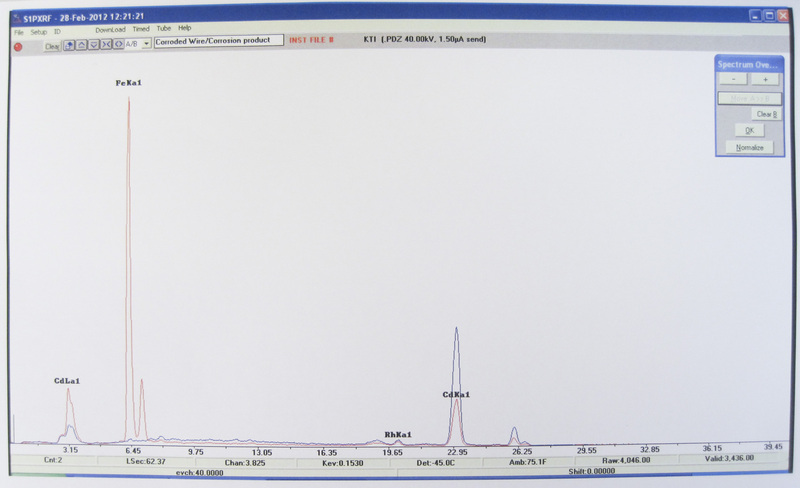 Portable XRF spectrum showing the presence of cadmium. Once the corrosion product was identified as cadmium, which is hazardous to our health, we took additional health and safety precautions by wearing particulate masks in addition to gloves and lab coats when handling the object and samples. The corrosion product was removed from the object with a scalpel and brush and kept inside a glass jar for later analysis that might be able to indicate the cause of the corrosion. 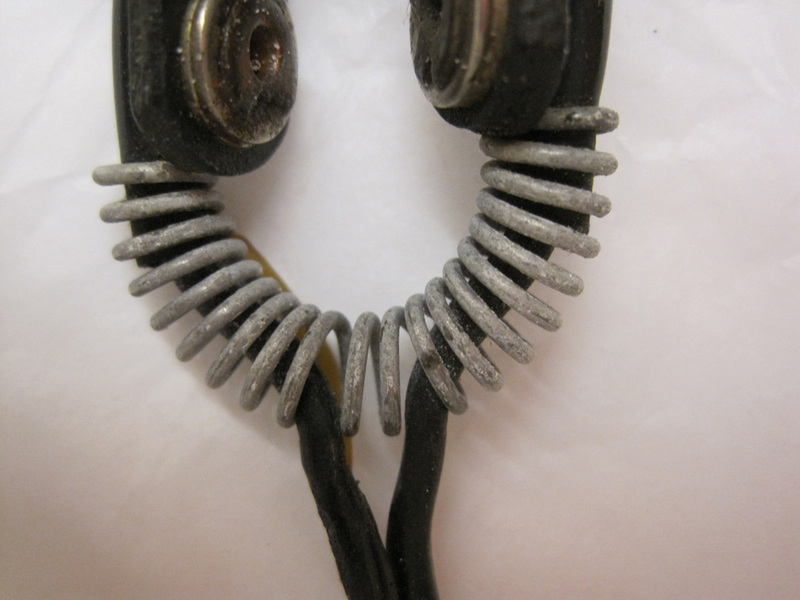 After removal of the loose white corrosion, the coil had a dull fogged silver-white appearance consistent with cadmium corrosion (Scott and Derrick 2007). The surface of the coil was slightly uneven in sheen and not uniform in appearance. Detail of the coil after treatment. After deliberation, we decided to place the object back on display even though the exhibition environment may be contributing to its corrosion. The tattooing instrument comprises a central part of the exhibit and was made and donated for the purpose of being displayed in it. These factors were weighed against the fact that the object had taken ten years to develop the corrosion we had just removed and therefore we expect that it will take several more years for the corrosion to return. Its condition will continue to be periodically monitored for the growth of additional corrosion. 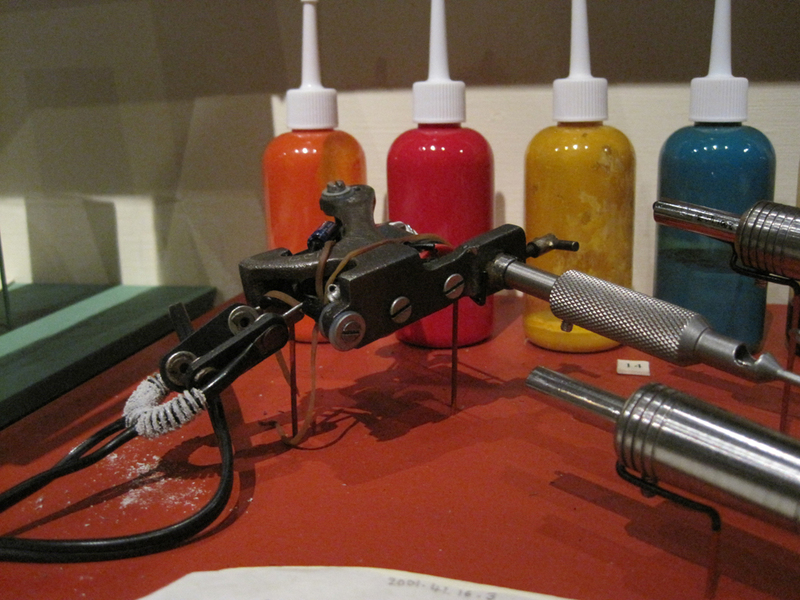 Now after examination and treatment, the tattooing instrument can be viewed again within the context of various components used for Western tattooing and enjoyed by visitors to the Pitt Rivers Museum. The tattooing instrument back on display after treatment. Odegaard, Nancy, Scott Carroll and Werner S. Zimmt. Material Characterization Tests for Objects of Art and Archaeology. London: Archetype Publications Ltd, 2005. Scott, David A. and Michele R. Derrick. “Deterioration of Cadmium-Coated Instruments in Museum Storage.” Studies in Conservation 52 (2007): 59 – 68. All text and images on this blog are © Pitt Rivers Museum, University of Oxford. The posting is the opinion of Robin Ohern and doesn’t necessarily reflect the Pitt Rivers’ position, policies or opinions. Categories: 3rd Year, Internships | Tags: Body Arts, cadmium corrosion, PItt Rivers Museum, tattooing instrument | Permalink. The UCLA/Getty program welcomes Margo Delidow, Andrew W. Mellon Fellow in Conservation Education at the Conservation Center of the Institute of Fine Arts, New York University. Margo is a sculpture conservator with a focus on contemporary art design and is co-owner of Whryta Inc. Conservation Studio in New York City. She received her BFA from the College for Creative Studies, School of Art and Design, Detroit Michigan and her M.A. and Certificate of Advanced Study in Conservation from the Art Conservation Department at Buffalo State College. She brings a unique skill set to the conservation profession as she possesses over 15 years experience of working with materials as a fabricator and moutmaker. Her comprehension of industrial processes, metal and woodworking were put to test as a research fellow in the Sculpture Conservation Laboratory of the Museum of Modern Art (MoMA). Her research at the museum focused on the materials and method of manufacture of architectural models, a subject that until Margo’s research has been largely absent from conservation studies. Margo developed and implemented exhibition and packing guidelines for architectural models that are now in use at the museum. She worked collaboratively with artists and curators to treat of works of Martin Puryear, Eileen Gray and Matthew Barney. Her recent research examines the nature of the collaborative process of art professionals in regards to the exhibition, preservation, and storage of contemporary art. During her two weeks with us, Margo will be sitting in on lectures and practical sessions offered in our program, as well as observe the different teaching styles of our faculty. While she’s here we will be taking advantage of Margo’s expertise in contemporary art and mountmaking by having her offer lectures and a hands-on session in our courses. First up, Margo will give a presentation and lead a discussion on issues in the conservation of contemporary art, a topic which has many parallels to ethnographic objects conservation. Margo will also give a lecture on mountmaking and hold a hands-on session to teach us some basics of making mounts. 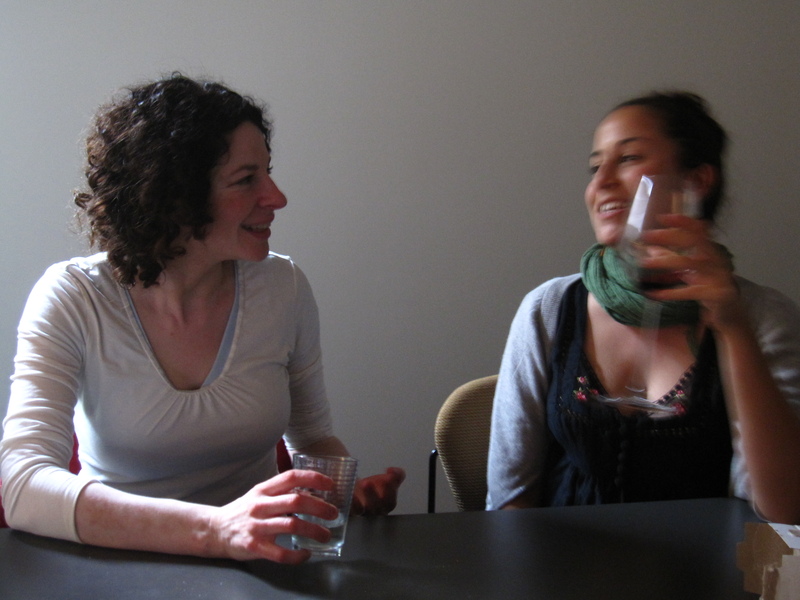 We’re excited to have Margo here and we all look forward to her teaching in our program! Margo Delidow (left) and 1st year Alexis North (right) continue the discussion on issues in contemporary art conservation after Margo's presentation of case studies on the topic. Categories: Visiting Scholar/Lecturer | Permalink. Setbacks are an often-unacknowledged reality of conservation practices. This paper examines various types of setbacks, shortcomings, and mistakes in conservation practice, including unsuccessful treatments, errors in judgment, and the limits of intervention. While it may be tempting for a young conservator to anticipate these types of experiences as ‘failures,’ we argue that these situations provide opportunities for growth and development. While a senior professional may readily recognize the value in setbacks and contextualize them by drawing upon their past experiences, we seek to explore the ways in which a less seasoned practitioner may productively reinterpret or reevaluate such situations in terms of our expectations, achievements, and sense of personal responsibility. Categories of setbacks will be illustrated with specific examples from personal experiences and those of our cohort-at-large as pre-program trainees and students. This project was first inspired by the attempted re-treatment of a ceramic object during the Fall of 2011 at the UCLA/Getty Conservation Training Program. While the objectives of the assigned exercise were unmet — the object was returned to the lending institution in the same condition that it arrived at our training labs— the student learned appreciably about the effects of material degradation, the decision-making process for designating an object as un-treatable, and the ethical considerations such conclusions require. Further examples of setbacks include errors in judgment — such as removing original polychromy by wheeling a tall, wooden sculpture into a low door frame — and a lack of self-awareness with drastic consequences for object safety when a ceramic figure was knocked off a table as a result of fatigue. By reflecting on and discussing the setbacks we encounter as inexperienced conservators, it is possible to glean lessons about our limitations and expectations of conservation practices, and to integrate these into our evolving working methods. Strategies for reevaluating these experiences include viewing them in terms of their positive role in developing long-term goals and practical methodologies as well as promoting a non-punitive and professional culture of honesty, humor, and acceptance. We hope that our attitude will help establish, in the words of Marincola and Maisey (2011), ‘a more fruitful learning culture’ for the benefit of both the field of conservation and its mission to protect and preserve historic and artistic materials. We hope that by encouraging a collaborative and collective acknowledgement of our limits and, simply put, humanity, will help redefine learning goals for emerging conservation professionals. We believe that fostering an open dialogue amongst our peers, and eventually the conservation community-at-large, will promote a deeper understanding of our methods and the body of wisdom from which we draw as a discipline. Additionally, we would like to promote the idea and organization of an online, perhaps anonymous, forum for practitioners at all stages of their careers to report similar experiences. The Kuba region, positioned in south-central Democratic Republic of Congo, between the Sankuru, Kasai, and Lulua Rivers, is widely renowned for its vibrant masking tradition. Funerals and initiation ceremonies often include a masquerade, honoring the initiate through dance, masks, clothing, and associated accouterments. While the fields of anthropology and art history have devoted significant time and study to the Kuba masquerade traditions, technical analysis of the methods and materials used in the masks’ fabrication is limited. During the fall of 2011, the first year students at the UCLA/Getty Program in collaboration with their colleagues in the Material Science and Archaeology departments conducted a technical study of a suite of eight Kuba masks in the Fowler Museum’s Wellcome Trust collection. Students employed both non-invasive and invasive techniques including: forensic imaging, X-ray fluorescence spectroscopy (XRF), and ultra-violet-visible-near-infrared (UV-Vis-NIR) spectroscopy, optical microscopy under white, plane, and cross-polarized light (PLM), X-ray diffraction spectroscopy (XRD), scanning electron microscopy (SEM) with energy dispersive X-ray spectroscopy (EDS), and microchemical testing. This paper endeavors to place the information gathered within the larger context of Kuba scholarship, by highlighting the common aspects between the masks as well as their variability. Examination of this collection of Kuba masks contributes to further understanding of the masks’ construction, adaptation, and use, thereby promoting a deeper and fuller understanding of the objects as historic artifacts as well as aid in determining proper methods of handling, storage, display, and conservation. Stabilization of eagle and Northern flicker feathers (Colaptes aurates) was undertaken on a Plains shield cover in the collection of the University of Pennsylvania Museum of Archaeology and Anthropology. Material testing for vane repair and loss compensation was conducted on damaged turkey feathers. Vane repair testing included bridges of hair silk adhered with 5% methyl cellulose as well as linings of light weight Japanese tissue, Hollytex (spunbonded polyester), and silk Crepeline each adhered with 2% methyl cellulose, Lascaux 360, Lascaux 498, or AYAF (polyvinyl acetate resin). Both of the Lascaux adhesives and the AYAF were painted onto the supports and reactivated with heat or solvents. Methyl cellulose performed better than the other adhesives and the hair silk bridges were the least visually intrusive and provided the best support. Loss compensation methods tested included two weights of Japanese tissue (light weight and heavy weight), as well as Hollytex adhered with 2% methyl cellulose. Since methyl cellulose performed better than the other adhesives, it was the only one tested. The lightweight Japanese tissue adhered best in the loss compensation tests. Hair silk and Japanese tissue adhered with methyl cellulose were used on the shield cover feathers with good results. The treatment of surfaces in African masking traditions reflects the adaptation of materials for cultural ritual and use. This poster presents a study of surfaces using micro-analytic techniques, whose results provoke questions regarding the masks’ methods of manufacture, material adaptation, and provenance. The colors of different chemical composition and microstructure were sampled from a suite of eight polychrome wood masks from the Kuba region of the Democratic Republic of Congo. Dispersion and cross-section samples of the wood and pigments were analyzed using polarized light microscopy (PLM) and scanning electron microscopy (SEM) in order to ascertain their chemistry and composition. PLM enabled direct observation of optical characteristics relating to particle size, habit, relief, and color under plane polarized light, as well as crossed polarized light observation of birefringence and interference colors, when present. Such characteristics successfully identified the pigments applied on each mask, and facilitated the comparison of manufacturing techniques and materials within the suite. As well, PLM and SEM analyses corroborated evidence attained from XRF, XRD, UV/Vis/NIR, and SEM/EDX investigations. This investigation contributes to our understanding of Kuba mask materials and production, as well as highlights the role of microscopy and microanalysis in the study of African masking traditions. Two relatively new imaging techniques, used by both the UCLA/Getty Conservation Program and the Getty Villa antiquities conservation laboratory, have recently been adopted to assist with the non-invasive analysis and documentation of artifacts. The UCLA/Getty Program utilizes a modified camera with an “alternate light source (ALS)” (Mini-CrimeScope®400), which is traditionally used in forensic science. Providing light at narrow band wavelengths using a series of filters, this equipment allows for easy analysis over a broad spectral range. Faintly painted figural outlines on a recently acquired lekythos in the Getty Villa collection were successfully photographed using this technique, and are now included on the object label in the museum’s galleries, illustrating how the vase once looked in antiquity. In addition to the ALS, scientists, conservators and students at the Getty make use of a modified camera system for capturing Visible-induced infrared luminescence of Egyptian blue. It can be used in-situ to confirm the identification of Egyptian blue without sampling, and has helped to identify areas of restoration, and areas of paint decoration that are difficult if not impossible to identify under normal lighting conditions. Several case studies involving these imaging techniques will be discussed. Categories: ANAGPIC, Conferences | Tags: conservation, CrimeScope, eagle, feathers, flicker, imaging, Kuba, masks, pigment, tunable light source | Permalink.